We really can’t argue with the title of this tinted postcard from the 1910s. Remarkably, it shows that the pattern of buildings hasn’t changed in either of the two blocks visible in the picture for over a century. In fact almost all the buildings are unchanged. The dominant building is obviously the Dominion Building, completed in 1910. Initially developed by the Imperial Trust in 1908, an over optimistic belief that the needed $600,000 construction cost would be easy to raise led to a shotgun merger with the Dominion Trust Company, and the building was completed in 1910. Perhaps it would have been called the Imperial Building if the merger hadn’t happened. The Dominion was said to be the first steel-framed building in the city, and on completion the tallest in the British Empire. Almost immediately the building’s owners suffered further financial crises, with the Dominion Trust Company forced into selling to the entirely unrelated Dominion Bank, ensuring that the name didn’t have to change. 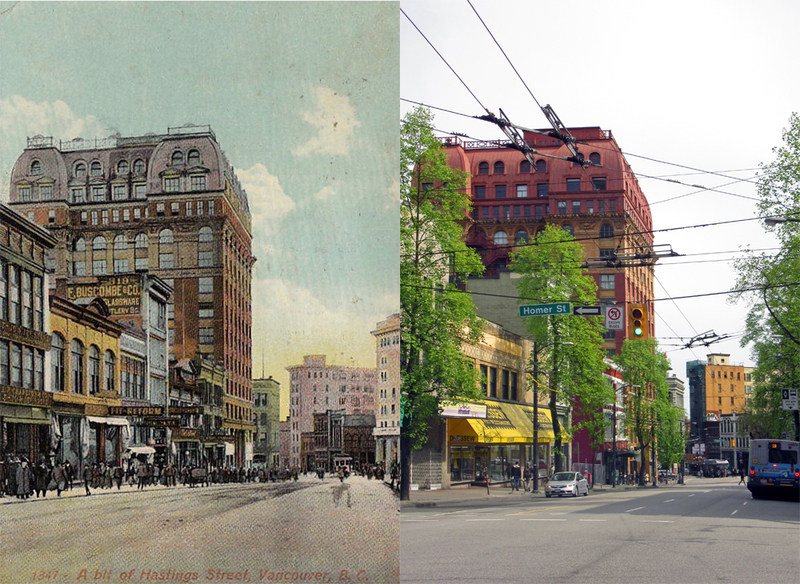 On the extreme left hand side of the picture is a building occupied by Vancouver Hardware and Thomson’s Stationers early in its life, hidden behind the tree in the contemporary shot. It was designed by Parr and Fee in 1898, and today has some terrible cement render replacing the original facade. The two-storey building to the east is The Mahon Block, designed by W T Dalton and built in 1902. In 1913 it was altered by W F Gardiner, which was possibly when an additional bay was added to the east, as far as we can tell for Thomson Brothers. To the east, the tall, thin building is still standing today – although in our summer shot the street tree hides it from this angle. It’s the Skinner building, and it was built in 1898, so the second oldest on the block. It’s four storeys tall with an almost fully glazed facade designed by W T Dalton for Robert B Skinner and Frederick Buscombe for Jas. A Skinner’s wholesale china and glassware business. Beyond that to the east was a rather handsome 1899 building, built for Thomas Hunter and designed by Blackmore and Sons. Today it’s one of the few ‘gap teeth’ in the city – the building was destroyed by fire in 2004. Next door to that is the oldest building on the block, the 1894 and 1898 Rogers Block built by Jonathan Rogers in two almost identical phases with William Blackmore and then Parr and Fee as architects. Looking down the street to the south side of the 100 block, the tall building is the Stock Exchange Building, a tall skinny office that was never actually occupied by the Exchange. Today it’s an SRO that has just had an excellent façade restoration. Like the Dominion Building it was designed by J S Helyer. Next door is a more modestly scaled building at 150 West Hastings dating from 1903, then two more Jonathan Rogers investments, one developed by his wife, Elizabeth. Hidden behind the tree on the right is the Province Building which started life (in 1908) as the Carter Cotton Building. The biggest differences between the two pictures are the addition of street trees, and the reduced volume of pedestrians on the sidewalks.